Deep venous thrombosis (DVT) is a blood clot that forms in a vein deep inside a part of the body. Deep Vein Thrombosis is the 3rd leading cardiovascular disease behind heart attack and stroke with 1.2M cases diagnosed each year in the US and EU. DVT mainly affects the large veins in the lower leg and thigh. It occurs when a blood clot forms in a vein deep within the body, particularly the veins that lie near the centre of the legs (i.e., ilio-femoral veins). Typically, these deep vein clots come on suddenly and without warning and may cause swelling and pain in the leg. The greatest problem, however, is that so long as the clot is present, the patient is at risk for potentially fatal PE. Late complications associated with DVT include recurrent clot and post-thrombotic syndrome (PTS). Non-specific signs may include pain, swelling, redness, warmness, and engorged superficial veins. Pulmonary embolism, a potentially life-threatening complication, is caused by the detachment (embolization) of a clot that travels to the lungs. Together, DVT and pulmonary embolism constitute a single disease process known as venous thromboembolism. Post-thrombotic syndrome, another complication, significantly contributes to the health-care cost of DVT. Prevention options for at-risk individuals include early and frequent walking, calf exercises, anticoagulants, aspirin, graduated compression stockings, and intermittent pneumatic compression. Current treatments include anticoagulants, Inferior Vena Cava Filter (IVCF) thrombolytic (fibrinolytic) drugs and Interventional Mechanical or Pharmaco-mechanical thrombectomy. Surgery is rarely needed. Thrombectomy, fasciotomy, or both are required for phlegmasia alba dolens or phlegmasia cerulea dolens unresponsive to thrombolytics to try to prevent limb-threatening gangrene. 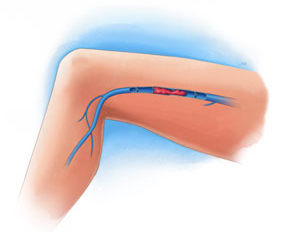 Vetex Medical has developed a novel platform medical device technology for vein clot management that reduces the cost, time and complications associated with existing treatment options, and hence represents a first choice interventional treatment for interventional radiologists and vascular surgeons.